The Ekornes Elevator Ring is designed exclusively for Stressless recliners and adds almost 1.3 inches to the height of your Ekornes chair. No parts or tools are needed for installation. You simply slide your Stressless recliner right on top of the ring and will "lock" into place. You can rest assured the recliner is connected to the ring as there will be a noticeable "click" once connected. Many of our older customers find that adding 1 or 2 Ekornes Elevator Rings makes it much easier to get out of the chair, by eliminating some of the natural stress that occurs to the knees when lifting yourself from a sitting position. Need to raise your feet instead? Order the Ekornes Ottoman Elevator ring. This works the same as the Ekornes elevator ring for Stressless chairs, but simply slides under your matching leg ottoman instead. It will remain attached and secure as the Black Plastic Pad Feet on the ottoman base wil slide snugly into pre-set holes in the ottoman ring. *Please note that the Ekornes elevator ring will not attach to the Stressless Signature-series chairs, Jazz or Stressless Blues recliners. There are 3 sizes of Elevator Rings for newer-model Stressless recliners. This page is primarily for those purchased before 2012. For those purchased after 2012, please type "elevator" in the search box at the top right of this page, or call 1-888-486-9463 so we can match you with the correct size (older models came in 2 ring sizes, rather than 3) for your Stressless recliner. Originally, the Small and Medium Sized Model Recliners fit onto wooden bases that had the same diameter circle underneath. This means Elevator Rings for Small/Medium Chairs Pre-2011 were the same width. Please confirm the clip count when adding this item to your basket (old style should have 6). How do you know which size you need? First, determine which size your recliner/chair is and you can do that most times by knowing the model name: e.g. Stressless Mayfair- Ships Fast and Stress-Free means you have a medium sized model. You should also select either 8 Clip or 6 Clip style before adding this item to your cart. Allow us to explain: In November of 2011, Ekornes announced that they would be revising their design of the wooden bases. In their changes, the actual diameter of the circular part of the wooden 2-Stem Bases, increased. The Post-2011 Styled Bases are a slightly different size and thus require a slightly different size Elevator Ring. The simplest way to tell which size you need is to lay your chair down on its back and count the number of Black Clips that connect the wooden base to the plastic swivel ring. There will either be 6 evenly spaced clips (3 in the front and 3 in the back) or there will be 8 Clips. On 8 Clip Models, there are 5 clips on the front and 3 on the back. For additional information and assistance, please don't hesitate to contact our wonderful Customer Service Team Members at 888-486-9463. A secondary method you can use to determine the number of clips is the "Prod. No." on the little white sticker underneath the armrest of your recliner. If the first 4 numbers of this item are 2011, then your wooden base was produced by Ekornes in 2011. This means it will most likely have 6 clips but we strongly recommend counting the clips while you are down there anyway. 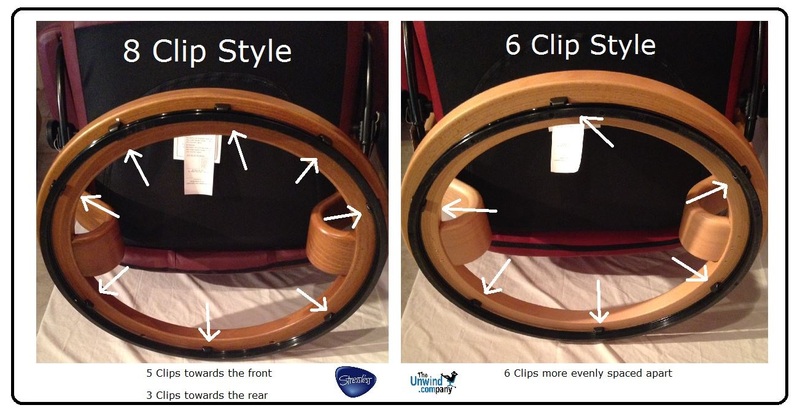 The 3 different sizes of elevator rings are for Stressless recliners purchased after 2012 and 2 sizes for those chairs manufactured around November 2011 or before). *Please note that Stressless Elevator Rings will only fit models manufactured by Ekornes from 1993 to Present. Prior to 2012, Ekornes manufactured 2 different sizes of wooden bases for the 3 chair sizes: The Small/Medium & the Large. Ingenious design allowed them to fit a Small and Medium Seat on a base that had the same diameter on the bottom. The engineers at Ekornes are constantly innovating and announced at the end of 2011, that they would introduce 3 sizes of bases: The Small, the Medium, & the Large. The bases are difficult to tell apart unless you lay the chair on its back and count the Black Plastic Clips that connect the Wooden Base to the Plastic Swivel Ring that touches the floor. If there are 6, your wooden base was produced prior to 2012. If there are 8, your wooden base was produced post 2012. Another important note is the ability to "Double-Stack" elevator rings. The folks at Ekornes thought ahead and knew that one elevator ring might not be enough for everyone. They have designed these rings to safely stack up to 2 rings. It is not recommended to stack more than 2. This would cause an imbalance in the center of gravity leading to a lack of stability as you recline. In order to stack your rings, you will need an Elevator Ring Connector Kit. This attachment kit can be purchased at Unwind.com and is readily stocked for fast shipping and your convenience. Ekornes provides a 5 year warranty on this Connector Kit at no additional cost to you. It is only necessary if you intend to stack Two Elevator Rings together. It includes a Black Swivel Ring and a set of clips to securely attach the top ring to the bottom one. If you order both elevator rings and the attachment kit at the same time, our team of Product Experts can assemble your "Double Stacked Ring Set" prior to shipping, upon request. This will even further simplify the installation/attachment. Come visit The Unwind Company Store to demo the Ekornes Stressless Elevator ring for yourself. If you have already decided and are ready to purchase, simply order it here securely. We will ship your Ekornes Elevator ring quickly and safely worldwide. Please review our return policy prior to ordering or call 888-486-9463 for personal assistance. You may also email stressless@relaxation.com anytime- 24 hours - 7 days a week.